K-Gas is a second generation, family-owned business. 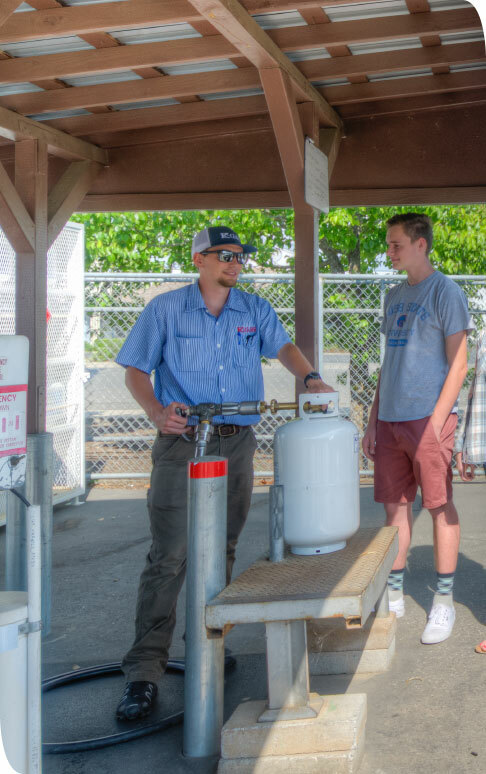 WE HAVE BEEN PROVIDING PROPANE SALES AND SERVICE TO FAMILIES AND BUSINESSES IN BUTTE COUNTY AND SURROUNDING AREAS SINCE 1955. When customer service makes a difference, you can count on us to be there for all of your propane needs. Although times may have changes, we believe in still carrying on those same old school values today. Our goal is to provide propane service that is both safe for our customers and our employees while treating you with excellent customer service. You will see that not only are we fairly and competitively priced but we genuinely care for our customers and will find us to be honest, reliable and straightforward. During business hours, you will reach a staff member directly that will help you in a friendly and efficient manner. Our drivers are responsible for delivering to you and keeping you in gas. They can help answer questions and always ensure safety for you when delivering. Our service technicians have many years of experience and training in proper propane and are available to assist you with questions. Our yard is the frontage road conveniently located off of Hwy 70 in Oroville. We have staff available during business hours to refill your BBQ bottles, cylinders, forklift tanks, vehicles and RV’s. If you are a home or business that we currently service, we will refill your tanks in our yard for your bulk delivery price. We also have a Parts Department to service your needs as well as cylinders for sale.